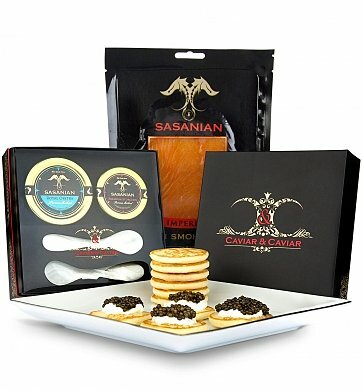 Caviar & Caviar, the most famous name in caviar producers worldwide, have curated this exclusive gift of perfect roes and smoked salmon, with a mother of pearl serving set to protect the caviar's delicate flavor. Royal Osetra Caviar: Firm, large amber pearls with a silken texture and nutty, buttery flavor. Two ounces. Premium Siberian Sturgeon Caviar: Dark grey to black medium-sized creamy pearls, seasoned with pink Himalayan salt for the perfect brine. One ounce. Scottish Smoked Salmon: Produced in Scotland and cold smoked in oak wood, this fine salmon's clean and fresh flavor is of top quality. 8 ounces. Russian Blinis: Similar to the taste and texture of a French crepe, the perfect accompaniment for caviar. 36 pieces. Mother of Pearl Serving Spoons: The material of choice for serving caviar, mother-of-pearl is nonreactive, letting caviar's fragile flavor reign. This royal set arrives presentation-ready in an elegant gift box. Royal Caviar Gift is a hand delivered gift. These gifts are delivered by one of our local design centers located throughout the United States and Canada. Same day delivery is available for most gifts when ordered before the cutoff time. The cutoff time for Royal Caviar Gift is 9 AM in the recipient's time zone. In a gift exclusive only to GiftTree, Caviar & Caviar present a collection of their finest roes, smoked salmon, and mother of pearl serving set to elevate any occasion to a royal affair. Royal Osetra and Siberian Sturgeon Caviar, Scottish Smoked Salmon. Includes two Mother of Pearl spoons and Russian blinis for serving. Presented in Caviar & Caviar's Exclusive Gift Box. Client was impressed by the presentation and the quality of the product. This is a must give item to someone important and respected.